BACTERIA could be the new hero in the fight against the spread of malaria. Researchers at the John Hopkins Bloomberg School of Public Health in the US have demonstrated how two different bacteria can halt the growth of Plasmodium falciparum, the parasite that causes malaria. It is estimated that the disease takes lives of around 800,000 people, mostly under five years of age. Currently, a three pronged approach is adopted to combat the disease: preventing infection by controlling its spread, treating people who are already infected and exploring options to vaccinate against future infections. The researchers found that Enterobacter, a bacterium naturally occurring in the mosquito’s gut could kill Plasmodium falciparum before it develops, by producing free radicals. 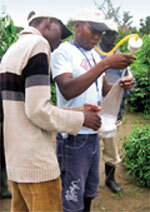 The team studied the gut of the wild anopheline mosquito species collected in Zambia and isolated the bacteria. Laboratory mosquitoes were then infected with Plasmodium parasites by artificial blood feed. The blood also contained the bacteria. The scientists found that the bacteria inhibited the growth of Plasmodium by up to 99 per cent, both in the mosquito gut and in a test tube culture of the malaria parasite. The study was published in the May 13 issue of Science. “Our study can form the basis of a control strategy that can be used with other methods,” says George Dimopolous, the lead author. In another study, researchers found that Wolbachia bacteria, which infect many insects including mosquitoes, reduce parasite levels and kill the Anopheles mosquitoes. Wolbachia does not naturally infect Anopheles mosquitoes. The researchers artificially infected the mosquito with different Wolbachia strains.“This is the first time anyone has shown that Wolbachia infections can reduce levels of Plasmodium,” says Jason Rasgon, the lead author of this study. For the study, the team infected Anopheles gambiae with two different Wolbachia strains. After infection, Wolbachia disseminated widely within the mosquitoes and infected diverse tissues and organs. The study was published in the May issue of PLoS Pathogens. Apart from relying on bacteria scientists are also working on other ways to counter malaria. Entomologists at the University of Arizona have designed a modified DNA strand which when inserted in the eggs of the mosquitoes creates genetically modified mosquitoes immune to Plasmodium. Nirbhay Kumar, a parasitologist from Tulane University, Louisiana, has developed a malaria transmission-blocking vaccine. It uses humans to generate antibodies against malarial pathogens. These antibodies are transferred to a mosquito during a blood meal. The antibodies target a specific protein the parasite needs to reproduce within a mosquito host.